In this extraordinary short story collection, human frailty is put to the test by the relentless forces of dark and light, man and beast. Each tale offers glimpses into familiar, shadowy worlds that push the boundaries of the spirit and leave the mind haunted with the knowledge that black juice runs through us all. Based on a Goodreads friend’s review, I went to the library in search of Margo Lanagan’s Tender Morsels. 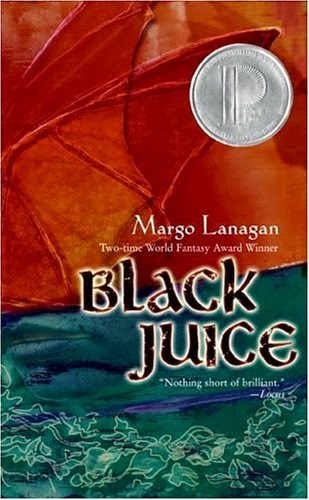 It was not available, so I borrowed a collection of short stories titled Black Juice. Indeed, each story in this collection is richly described, dark and disturbing. Almost too dark to be shelved with books for “Young People”, but what do I know? I have no children and really have no idea what they enjoy reading or how sophisticated their tastes may be. Black Juice is beautifully written in a mature style that is suitable for adult readers as well. Each of the ten stories features a young character, and explores his or her role in society and within the family. Many issues are explored – love, death, relationships, abuse, marriage, freedom. The stories are set in fantastical worlds that share some similarities to our own, yet are very different. Some of my favorites in this collection were “Singing My Sister Down”, told from the perspective of a young boy who watches and sings along with his family as his sister is being punished for killing her husband. “Red Nose Day” is about two young snipers who go out on a shooting spree in revenge for past injustices.“Sweet Pippit” is a lovely and touching story about elephants in search of their beloved handler. “Earthly Uses” is a very sad story about a young boy who searches for an angel to bring back for his dead grandmother. I will definitely read more by this author…later. Right now I’m emotionally drained.